One of my resolutions this year was to come up with projects that would help to bring the scrap bag under control. Surprisingly, the best way to achieve control seems to be to actually use these scraps 🙂 Wash Day Blues is a great project for that purpose. 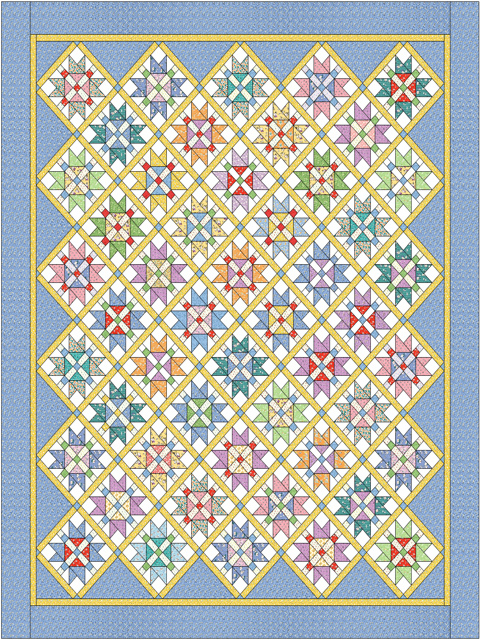 Techniques used in this block are pieced sashing, fast flying geese, half square triangles, all nestled beautifully inside of a sashed diagonal setting. 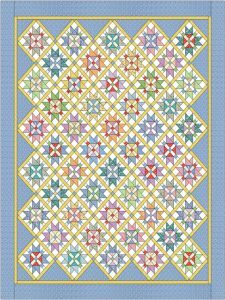 The original quilt used my 30’s reproduction fabrics scraps, but this would also look great using any other fabrics of your choice as well. Quilt finishes at 83 inches by 97 inches, but would be simple to make smaller or larger if desired. second session of the Wash Day Blues on Friday Afternoon.